This is another Italian grinder. It comes from Tre Spade, an Italian company specialized in producing household appliances. 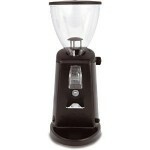 It has a plastic exterior, but inside it has good quality burrs and produces quality grind. Il Macinino is easy to use, is small and can therefore suite in kitchen quite well. Its powerful motor is programmed to perform slowly so it will not heat the beans. By the purchase you get stiff brush for cleaning included. 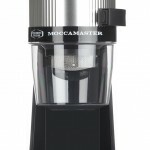 It is easy to clean and use and is especially good if you like to make a good espresso at home. The grinder comes in a chrome color. Tre Spade conical burr coffee grinder features a set of steel conical burrs that last longer and provide more accurate precision when grinding. It produces good grind quality. They are however not recommended for continual use or commercial grinding. They are also easy to clean. 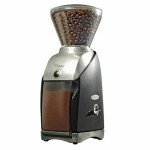 The grinder is equipped with 95W motor. Coffee can be grinded directly into your coffee handle or into the removable hopper. It is grinding at a low speed to prevent heating of the coffee, making it more quality. Bean hopper has a capacity of 8 ounces (200g). It is removable. You can either grind the coffee beans into the hopper or even straight into a filter. As a result, cleaning is simple and quick. Also grind bin is fitting the grinder quite well and is preventing grinds from escaping during grinding. You can also grind directly into the espresso basket. The grinder has 9 grind settings, from coarse to very fine. A simple knob can be dialed from one to nine, providing multiple grinds, while the instruction sheet details which number to use for the brewing style you prefer. The grinder has an automatic shut off. It does not have other functions so it is very easy to use. The grinder is made of chromed plastic. Also bean hopper is made of chromed plastic. Burrs are on the other hand made of tempered steel. The grinder is relatively loud to use. The plastic exterior does not block a lot of noise created by the machine. Because of that it is not as heavy as some others but also does not block that much noise. Because of its relatively simple design and easiness of detaching the bean hopper, cleaning is not very difficult. You also get stiff brush included for cleaning oils and other remains from blades. The grinder is also not too messy. The cleaning needs to be performed regularly for good quality grinding. 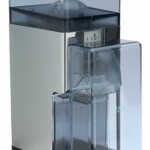 The manufacturer has a warranty for this product at duration of 1 year. Not many customers have so far purchased this product. There are therefore not a lot of reviews. The customers are satisfied with grinding and durability, but they sometimes complain about noise and plastic exterior. The price fluctuates around 170-220$ for this grinder. Also a stiff brush for cleaning is included in the price of the grinder. 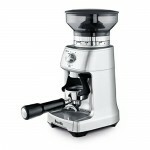 Tre Spade il Macinino is Italian grinder for a decent price. It looks a bit cheap with plastic exterior, but it does provide a consistent high quality grind. It is easy to use and also for cleaning. It is likely to have a very long time span. Of course it also has its minuses (it is loud and only has 9 grind adjustments). But if you are willing to overlook them, it could be a good candidate to buy.